Hiking is a charming activity. It connects you with the elements: rocks, dirt, trees, leaves, bushes, shrubs, air, water, etc. In these two weeks, Lap-Chee hiking team will arrange two hiking events to get close to nature. Join in our hiking to the Victoria Peak this Saturday (Oct. 7) and bring out the inner-animal in your body during the wonderful interaction with nature. 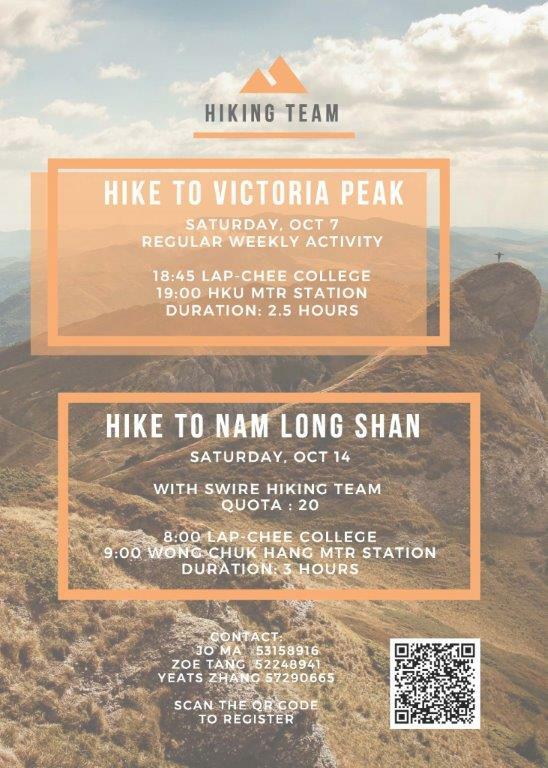 This event is a regular hiking event arranged by Lap-Chee hiking team and we have different hiking trails every one or two weeks. This week, we will have a bird’s eye-view of the great night piece of the Victoria harbor from the hill. Join us and enjoy the beautiful view of Hong Kong. You can choose to gather at college at 18:45 and come to school with us by MTR, or meet us at 19:00 at MTR station Exit A2. Route: From HKU campus to the Victoria Peak. It will take approximately 2.5 hours, and you can choose from walking or taking bus to get down from the peak. This time we cooperate with SWIRE Hiking Team and hike to Nam Long Shan. Nam Long Shan overlooks the South China Sea in the south, Sham Wan and Aberdeen Channel in the west, and Deep Water Bay in the east. This time, you can enjoy the sea-view from the other part of Hong Kong. In addition to the great view, it is also a great opportunity to make friends with students from Swire hall, if you have friends in Swire hall, just call them to register this event in Swire and you can hike with them! Again, you can choose to gather at college and come with us or go to the MTR station by yourself. Please register by scanning the QR code in the poster or use the following link. If you have any question, please contact Jo MA (53158916) and Zoe TANG (52248941).